Today we are going to share with you part one of our tutorial on how to make a 3D fall paper flower bouquet. 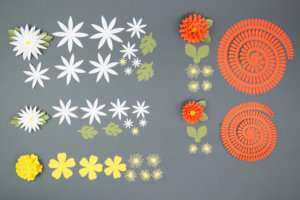 In this first tutorial, you will learn how to prepare flower designs and cut them out. In a week, we will explain how to shape and assemble the flowers and arrange them in a bouquet. 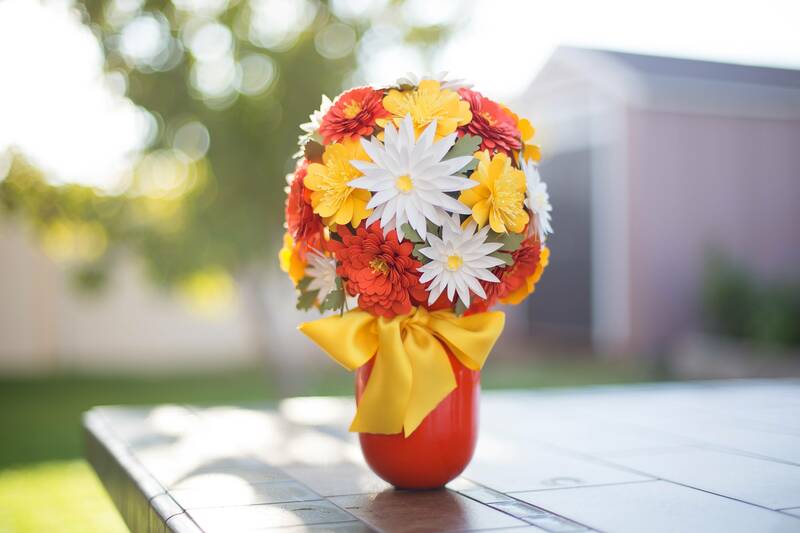 This bouquet will bring bright colors into your life, and it can be a great gift for your family and friends! One important benefit of this bouquet is that it will last a lot longer than real flowers. By following our instructions, you easily can create this beauty. Are you ready to start? 1. 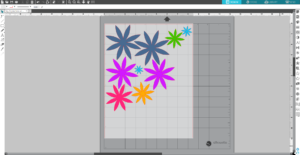 Download and open the 3 Mix & Match Flowers design (Design ID #78672) in Silhouette Studio® and adjust your page settings (in the Page Setup panel) according to the size of your paper and your cutting mat. 2. Ungroup the design and delete all of the flower petals except for one blue flower petal. Select it, right-click, click Release Compound Path, and delete the circle in the middle. Two that are 3.4 in. x 3.4 in. Two that are 3 in. x 3 in. One that is 2.6 in. x 2.6 in. One that is 2.1 in. x 2.1. in. One that is 1.8 in. x 1.8 in. Two that are 1 in. x 1 in. 4. 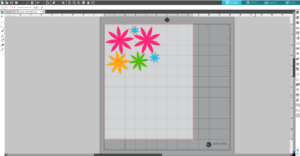 Place white paper on the cutting mat and load it into the Silhouette machine. In Silhouette Studio®, go to the Send tab, choose “Copy Paper, Medium” as the material, and click Send. 5. This makes one big chrysanthemum. For this bouquet, you will need four big chrysanthemums in all. Two that are 2.6 in. x 2.6 in. 2. Place the white paper on the cutting mat and load it into the Silhouette machine. In Silhouette Studio®, go to the Send tab, choose “Copy Paper, Medium” as the material, and click Send. 3. You will need five small chrysanthemums in all. 1. Take the small chrysanthemum petal layer and resize it to o.8 in. x 0.8 in. and make nine copies so that there is one yellow center for each chrysanthemum. 2. 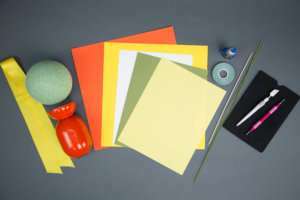 Place the sunshine-colored (yellow) paper on the cutting mat and load it into the Silhouette machine. In Silhouette Studio®, go to the Send tab, choose “Copy Paper, Medium” as the material, and click Send. 1. Download and open the 3D Chrysanthemum Flower design (Design ID #78927). Adjust your page settings according to the size of your paper and your cutting mat. 2. Ungroup the design. Delete flower design and keep the leaves. 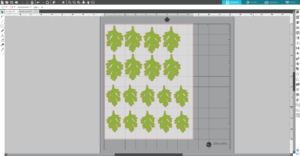 For the big chrysanthemums, resize the leaf to 2.5 in. tall x 1.7 in. wide and make a total of eight copies. 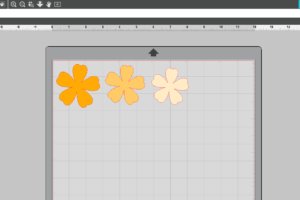 For the small chrysanthemums, resize the leaf to 2.05 in. tall x 1.4 in. wide and make a total of ten copies. 3. Place eighteen leaves on the work space. 4. 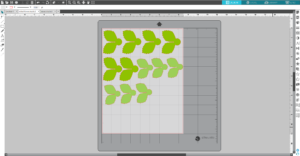 Place the moss-colored (green) paper on the cutting mat and load it into the Silhouette machine. In Silhouette Studio®, go to the Send tab, choose “Copy Paper, Medium” as the material, and click Send. 1. Download and open the Rolled Flower design (Design ID #130238). Adjust your page settings according to the size of your paper and your cutting mat. 2. Ungroup the design. Move the leaf and the circle aside. If you are using 12 in. x 12 in. card stock, place two copies of the aster design on the work space. Resize one copy to 7.7 in. x 7.6 in. and another copy to 6 in. x 5.9 in. 3. 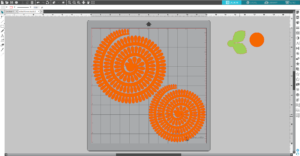 Place the orange card stock on the cutting mat and load it into the Silhouette machine. In Silhouette Studio®, go to the Send tab, choose “Cardstock” as the material, and click Send. 4. Repeat the process five more times for a total of six large flowers and six small ones. 1. 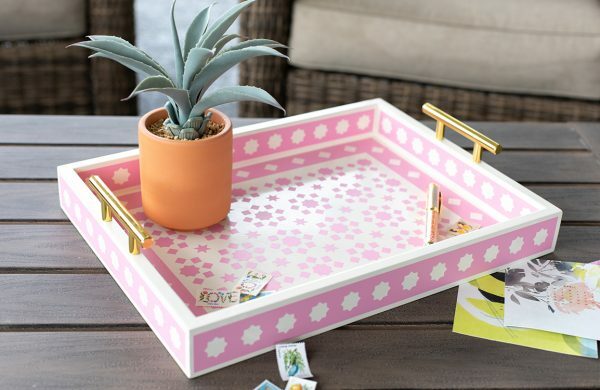 Move the flower design aside and place the leaf on the work space. The leaf for big aster doesn’t need to be resized. Then make five copies of the leaf so that there are six copies. 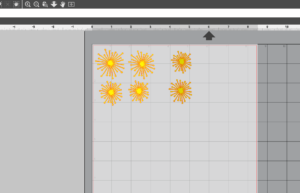 For small the asters, we will need to resize the leaf to 1.7 in. x 2.1 in. and have six smaller leaves. There should be twelve leaves in total. 2. Place the moss-colored (green) paper on the cutting mat and load it into the Silhouette machine. In Silhouette Studio®, go to the Send tab, choose “Copy Paper, Medium” as the material, and click Send. 1. Download and open the 3D Chrysanthemum Flower design (Design ID #78169). 2. Don’t ungroup this design because it will be the center for the large aster flower. (There are four layers in all in this one design.) Resize the design to 2.881 in. x 3.038 in. For the smaller aster flower, ungroup the design and make a copy of two smallest layers for small aster center. 3. You will need six sets of four-layer centers to complete the large aster flowers and six sets of two-layer centers to complete the small aster flowers. 4. 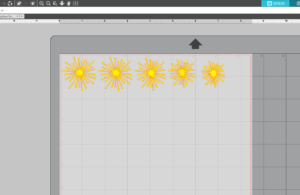 Place the sunshine-colored (yellow) paper on the cutting mat and load it into the Silhouette machine. In Silhouette Studio®, go to the Send tab, choose Copy paper as the material, and click Send. 1. Download and open the 5-Petal Flowers design (Design ID #17805). Adjust your page settings according to the size of your paper and your cutting mat. 2. Ungroup the design and delete all of the flower petals except for the one shown below. Select it, right-click it, click Release Compound Path, and delete the circle in the middle. 2.6 in. x 2.6 in. 2.35 in. x 2.35 in. 1.8 in. x 1.8 in. 4. For the bouquet, you will need nine roses. 5. 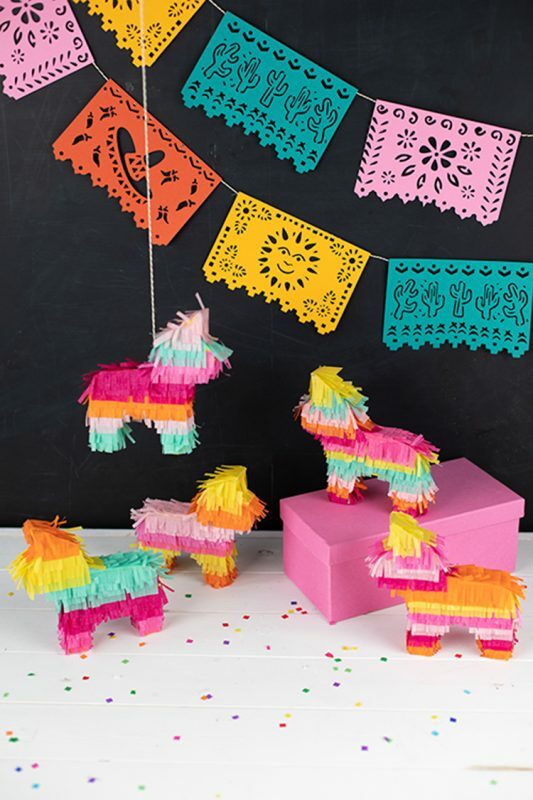 Place the yellow card stock on the cutting mat and load it into the Silhouette machine. In Silhouette Studio®, go to the Send tab, choose “Cardstock” as the material, and click Send. 1. Open the 3D Chrysanthemum Flower design (Design ID #78169). 2. Resize the design to 2.881 in. x 3.038 in. Then Ungroup the design and make a copy of the biggest petal layer. In all, you will have five layers. This set will be the center of one rose. 3. You will need nine sets of centers to complete the roses. 4. 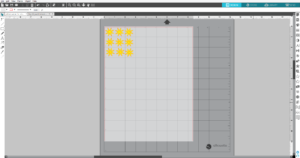 Place the sunshine-colored (yellow) paper on the cutting mat and load it into the Silhouette machine. In Silhouette Studio®, go to the Send tab, choose “Copy paper, Medium” as the material, and click Send. Now all of the flowers, flower centers, and leaves are cut out. We will share all of the tips and tricks for shaping and assembling the flowers for the 3D fall paper flower bouquet in part two, which will be posted in a week. Japanese Rose centers look to be at least 2 or 3 different sizes, but the directions only have one size listed. Are we to re-size some of the centers?